I still remember the first time I read The Lorax. I was not a child, but a teenager. The message of conservation and environmentalism fed my budding philosophy of life. When I became a parent, it was one of the first books I bought my own children. I wanted to influence them early in life to care for nature. It’s easy for me to appreciate and conserve nature, but I do fall into the trap of consumerism, especially when it comes to sustainable fashion. Similarly, our children are bombarded with marketing that leads to desire for the latest toy or gadget. In such circumstance, we must remember lessons from the Lorax: WE DON’T NEED A THNEED! What’s a Thneed? In Dr. Seuss’s book, Thneed production was the cause of the destruction of the Truffula Trees. They represented something everyone had to have even though they didn’t need it. It didn’t matter what it did to the forest and creatures that lived there. Consumer desires trumped environmental concern. This desire caused every last tree to be cut down in the Truffula forest. When it was published in the fall of 1971, “The Lorax” was ahead of its time. When the environmental movement exploded a decade later, the popularity of “The Lorax” took off with it. Readers young and old were now seeing themselves in the story of a boy searching for answers to what happened to the trees. The Lorax is one of the most important books that Ted wrote, and it is one of my favorites. This film celebrates the book in such a beautiful and inspiring way. I think Ted would be quite proud. Welcome to Thneedville, a city they say that was plastic and fake, and they liked it that way. No nature, no flowers, no one seemed to mind, but a secret was waiting for someone to find. We came up with the idea to have Thneedville be a bit more relatable. It’s like Vegas or Disneyland or Abu Dhabi. We see ourselves in it a bit, and it is kind of fun. There are inflatable bushes and mechanical flowers and trees, and it’s a place with no real nature. Everyone seems to be happy, and they have everything they want: from giant cars to robots and other mechanical devices. But then it becomes a question about sustainability. While all this stuff is fun and great, is it in balance with the broader planet, and how do we maintain that balance? Do you live in Thneedville? What are the Thneeds in your family? I have held off on that new iPhone (yes, I still have a 3GS) as a personal Thneed. My children are smart. They don’t often fall for Thneed marketing, but they aren’t immune. My son has childhood apraxia of speech, and one of the first words he could articulate was “need”. It’s part of our culture. We need Thneeds! The first step to eliminating Thneeds from your life is to identify them. Once identified, you can resist by seeing that object of desire for its true colors. You can live without it! You must live without! Your family budget and the environment will benefit. Reduce and reuse are the most important Rs! Think of the Lorax and the Truffula Trees! If we don’t eliminate the Thneeds in our lives, we may someday here our own children say, “What I want more than anything is to see a real living tree!” Stories like the Lorax inspire our own children to become the Lorax (it did for me personally). Ironically, the book was published the year I was born. The personal influence continues today. 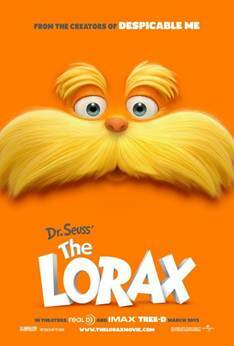 This post is part of a Blog Tour for Universal Pictures’ DR. SEUSS’ THE LORAX that it is in theaters on March 2. Don’t forget to visit The Smart Mama on February 23 for the next post in our LESSONS FROM THE LORAX Blog Tour! « Is There Arsenic in My Baby Formula? Such a great blog, Jennifer. I always keep several copies of The Lorax in my house to give out to kids who may be visiting and whose eyes get drawn to it. Such a timeless message that should be heard more loudly now than ever before. Thanks for sharing your thoughts. Happy your kids are Thneed-free, albeit it was your son’s first word. *sigh* Yes we all buy many things we want but don’t need. I have my new iPhone sitting next to me, I will say my last phone was pretty old for a phone these days and was locking up all the time. We have to remember to stop and think before we buy things, if it’s not a need how much use will we get, what’s it’s impact and is it worth it. And we need to care for our things so they last longer! Jennifer, while your blog and point made here is great (that we, and our children do not need a thneed), after reading it I am now more in the mindset NOT to watch than I was before (which I was already set to boycott it). The quote from the director is horrible! “There are inflatable bushes and mechanical flowers and trees, and it’s a place with no real nature. Everyone seems to be happy, and they have everything they want: from giant cars to robots and other mechanical devices. But then it becomes a question about sustainability. While all this stuff is fun and great, is it in balance with the broader planet, and how do we maintain that balance?” To even show a world that even seems great without nature is a dangerous message to send. A bright, sunny, colorful world is not what we would have in a world where the trees are gone, the air and the water is polluted, and the animals have hit the road. Now I realize that this is a kids movie, and so yes, you don’t want to scar them by showing the doom that we all face if we continue down our path of unsustainability, but this world of Thneedville that they’ve created to flush out the story and add a few more minutes to make it Big Screen worth is despicable. And to make matters worse, last night, after I tucked in my little one, and went to watch a show on my little bedroom TV, a commercial came on. Mazda. The lorax friendly car. WHAT?!?!?! If the whole point of the movie is the same as a book, which is a message of the dangers of overconsumption, then what are they doing lending the name of a treasured book to the SELLING of cars. Beware of the lorax movie…new word for the kiddos: Greenwashing. Good points Crystal! I probably won’t go see the movie either. My kids thought the trailer looked “stupid”. They love the book!